Billed as a Celebration of Love, Sunday night’s special Valentine’s Day episode of The Bachelor was, as you may have guessed, many things—an excellent promotional opportunity for the show, a preview for the rest of this season, a chance for one couple to have their wedding paid for and their 15 minutes to continue. But it was barely about love. In this way, it was a perfect addition to the franchise; despite host Chris Harrison’s pronouncement that the show is all about finding “true love,” and that they pack each season with as many “genuine hopeless romantics we can find,” very few minutes of the episode were actually devoted to love as much as the presentation of it—plus the drama that surrounds it. Instead, the highlights were the recaps of astonishing moments from many seasons ago, which are worth marveling at if only for the contestants’ sartorial and makeup decisions. Luckily, ABC posted some great ones online you can watch without sitting through two hours of blather. For instance, here’s Jason rejecting Melissa and picking Molly after originally rejecting her. Or Chris Soules leaving two women in the badlands. Or Allie sending Justin running after she found out he had a girlfriend in Canada. Jake and Vienna discussing their breakup, however, really takes the cake. None of these moments, however, are particularly romantic, though they are fascinating to watch. Which makes statements like current Bachelor Ben telling Chris Harrison that “It’s really nice to be in this environment and see all these success stories” feel so hollow, even though the show seems to be poking more fun at itself than it has previously. Yes, the franchise has miraculously managed to end in some successful relationships—I suppose statistically it was bound to happen—but their avowal that it’s resulted in “ten marriages and countless engagements” is pretty sad when you think about it—just because someone is forced to get engaged at the end of a season and then breaks up with that person does not make it an impressive relationship. Most of the clips aired from past seasons of the show were of relationships that are no more, ones that didn’t last very long at that. A less cynical person would argue that whether a relationship ends does not negate its worth—and outside of this universe, that certainly is true. But watching Jade and Tanner’s wedding (of The Bachelor and Bachelorette, respectively, as well as Bachelor in Paradise, where they met) have to take a sidestep for the show to discuss other people’s failed relationships was both pretty boring and a little sad. (Though nothing was as depressing as watching Seal perform at their reception. Seal... is this what it’s come to?) 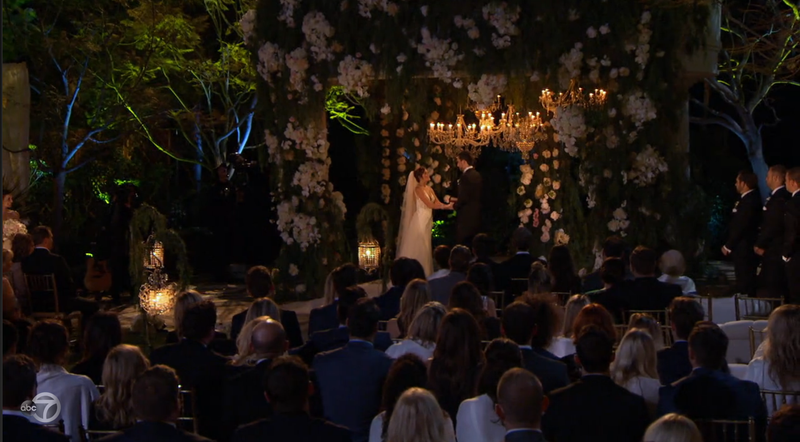 The well-edited promo for the episode suggested that other contestants might find love at this “largest gathering of the Bachelor family ever” as well, but watching Ashley I. cry (again) as she had a non-conversation with Jared about their non-relationship was not watching someone find love. Nor was Clare Crawley chattering about being one of the old ladies of the franchise, and remarking on the new fresh meat she spied. Or Chris Soules, once labeled the franchise’s All-American good guy, almost gleefully talk about how he’s a single man again. “I honestly owe my life to The Bachelor,” said Sean Lowe, who is married to Catherine, whom he got engaged to at the end of his season (the pair are now expecting a baby). Well, yes, in the non-literal sense that’s true. But the only people who can really say they owe their life to the franchise are the children of Bachelor contestants, and we can just imagine where they’ll be in another 20 or so seasons: on this show, during a very special season where the kids of former contestants come to the show that lead to their conception to see if it works for them. The ratings will be through the roof!